These SentinelOne Support Terms (the “Support Terms”) apply to the customer support provided by Sentinel Labs, Inc. (“SentinelOne”) with respect to the SentinelOne solutions (“Solutions”) subscribed to by the customer (“Customer”) under the SentinelOne Terms of Service (“Terms,” available on the SentinelOne website https://sentinelone.com/terms-of-service/, or another version of the Terms agreed to in writing among the Customer and SentinelOne) (“Support Services” as described in details below). Support Services are expressly conditioned on Customer abiding by terms of the Terms, and the Terms are hereby incorporated by reference to these Support Terms. Support Services provided to Customer are coterminous with the term stated in a valid Order Form for the subscription to the Solutions. Support Services are not cancellable during a given the Solutions subscription period. Capitalized terms not defined but used herein have the meaning assigned to such terms in Terms. In the event of any conflict between these Support Terms and the Terms, the terms of the Terms shall control unless clearly stated otherwise in a version of these Support Terms executed by SentinelOne. In the event Customer has purchased the Solutions and Support Services from SentinelOne through a SentinelOne authorized partner (“Partner“), Customer will be entitled to all the rights set forth herein as related to the Support Services acquired and paid for by Customer, provided that Customer: (a) is the original purchaser of the covered Solutions, (b) provided with its purchase of the Solutions true, accurate, current and complete information to SentinelOne or the Partner; and (c) has maintained and updated such information to keep it true, accurate, current, and complete during the term of Customer’s subscription to the Solutions; and in each of (a)-(c), subject to the relevant Partner providing certain support services to Customer under a separate agreement among Partner and Customer. Support Plans: SentinelOne offers Professional Support and Enterprise Support levels (“Support Plans”) to customers, as further detailed in these Support Terms and related Documentation, as stated in each case in a relevant Quote or Purchase Order. Support Hours: 9X5 (business hours) during weekdays for Professional Support; 24X7 365 days per year for Enterprise Support. Support Services: Support Services consist of (a) reasonable web and e-mail support for Professional Support Plan; email, web and phone support for Enterprise Support Plan (all Support Services provided in English), (b) reasonable efforts to resolve Malfunctions to keep the Solutions in conformity with the Documentation, and (c) releases, modifications and enhancements to address unresolved errors due to interoperability issues with third party solutions, in accordance with SentinelOne’s release schedule (collectively, the “Refinements”). Support Services do not include (i) support with respect to hardware on which the Solutions or any portion thereof may be installed, or (ii) any monitoring and/or incident response services. SentinelOne has no obligation to develop any particular Refinements, and products/solutions marketed by SentinelOne as separate products, or as upgrades for which additional fee is generally charged, are not considered Refinements. Version: Generally available (GA) release of a SentinelOne Software product designated by the number which is immediately to the left or right of the left-most decimal point in a SentinelOne Software version number, as follows: (x).x.x or x.(x).x. Support Policy: SentinelOne provides Support Services for (a) its most current Version of the Solutions (including all Refinements thereof), and (b) the immediately preceding Version of such SentinelOne Software. Provided Customer is in compliance with all of the terms of these Support Terms and the Terms, and has paid all applicable Support Fees, SentinelOne will provide to Customer the Support Services set forth herein. In addition, SentinelOne will provide, upon Customer’s request, periodic reports on the status of the Support Services requested by Customer. A “Malfunction” means any error or other condition that prevents the Solutions from performing substantially in accordance with the operating specifications in the then current Documentation, excluding Solutions inoperability caused by an Exclusion, or to the extent caused by an event beyond SentinelOne’s reasonable control. A “Response Time” means the elapsed time between the first contact by a designated Customer representative support contact or their designated Partner to report an issue, and the target time within which SentinelOne’s personnel report back to the designated Customer support contact to acknowledge receipt and start work on Malfunction resolution. An “Action Plan” is a formal verbal or written description of the tasks to be undertaken by SentinelOne and Customer to diagnose, triage, and address a support issue, along with an approximate timeframe for the processing and completion of tasks. 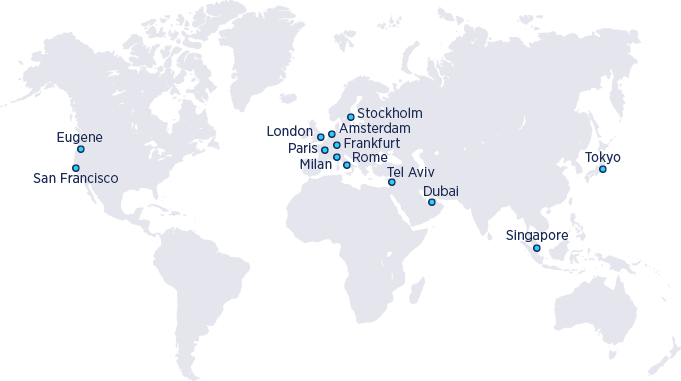 Upon receiving Customer’s initial support request, SentinelOne’s qualified personnel will use commercially reasonable efforts to respond to Customer’s request via outbound e-mail, web or phone consultation (based on the Service Plan purchased) for assistance and advice as described herein within the Response Times stated in the table below. In providing Support Services, SentinelOne support personnel may interact with Customer’s Solutions instance, review application data within such instance and otherwise exchange relevant information with Customer as needed to provide such Support Services. When a suspected Malfunction is reported, SentinelOne will analyze the information provided by Customer and will classify the Malfunction. SentinelOne will use commercially reasonable efforts to repair any Malfunction in any Solutions component, or replace the malfunctioning Solutions component, in each case to the extent attributable to Customer’s use of the Solutions in accordance with the Documentation. The remedies set forth herein are Customer’s sole and exclusive remedy with respect to any Malfunction. SentinelOne has no obligation to provide Support Services or Refinements with respect to any Solutions component inoperability caused by, related to or arising out of any accident, abuse, misuse or unauthorized use, or any combination of the Solutions with any software, hardware or other item not approved in writing by SentinelOne (each, an “Exclusion”). SentinelOne’s personnel will contact Customer’s designated contact(s) within the Response Times detailed in the table below to explore the nature of the Malfunction experienced by Customer, determine whether the Malfunction is related to the Solutions, reasonably assign a priority level to the Malfunction in accordance with definitions in the table below, and reach an Action Plan. A Response Time is a guarantee of communication timeframes, and SentinelOne does not guarantee a problem fix, workaround, or other final disposition within these timeframes. Customer Responsibilities: Before contacting SentinelOne with a suspected Malfunction, Customer undertakes to: (a) analyze the Malfunction to determine if it is the result of Customer’s misuse, the performance of a third party or some other Exclusion or cause beyond SentinelOne’s reasonable control, (b) ascertain that the Malfunction can be replicated, and (c) collect and provide to SentinelOne all relevant information relating to the Malfunction. If SentinelOne determines that a reported Malfunction is related to an Exclusion, then upon written notice to Customer, SentinelOne may charge for employee time expended at SentinelOne’s prevailing time and material rates, plus reasonable out-of-pocket expenses, and SentinelOne will be released from the Support Services obligations for any modified portion of the SentinelOne Solutions to the extent such modifications were made to correct such Malfunction.